Obituary for Aaron D. Oates | Minor-Morris Funeral Home, Ltd.
Aaron Darnell Oates was born in Chicago, Illinois at home on August 10, 1965. He was the third child of six children born to the proud parents of Argola and Geraldine Oates. Aaron was the only son born to this union. His father Argola Oates, Jr., preceded him in death. Aaron accepted Christ at an early age. He grew up attending Antioch Missionary Baptist Church of Roseland. Aaron attended and graduated from Fenger Academy High School and continued his education at Washburne Trade School in Chicago, Illinois for auto body and fender work. For three years he worked at Clearbrook Center in Rolling Meadows, Illinois with individuals with Intellectual and Development Disabilities. He also worked at a couple mechanic shops, working on cars throughout Chicago. 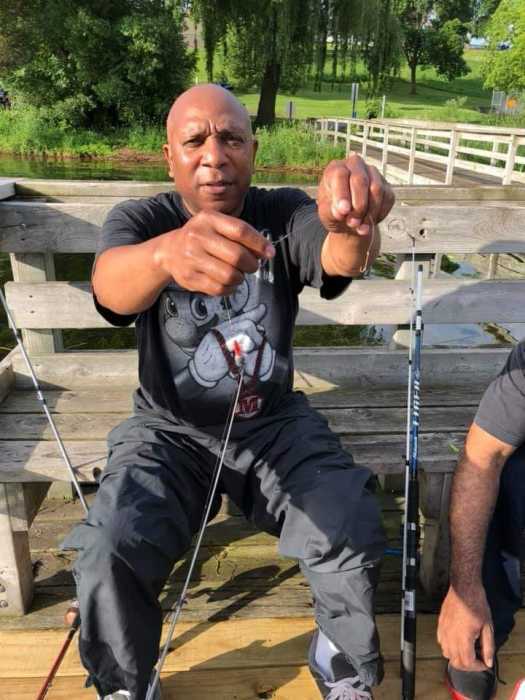 Later in life, Aaron moved to Minnesota to enjoy a quiet life with family friend, McClendon Miller, known to the neighborhood as “Snoozie” until his death, who he grew to love as a brother he never had. Aaron was a fun and outgoing person with a killer smile. He was a wise person in his own way, he would give you advice even if you didn’t ask. Once he started talking, you could not get a word in. He enjoyed being with his family and friends, especially his neighborhood crew; Kenny (who preceded him in death), Terry, Daryl, Glenn, Snoozie and Kasey. Aaron loved to barbecue, fishing and working on cars. Throughout his life, he loved working on cars (he could make a car shine) until his death. If you needed your car fixed, call Aaron (if you could catch him). That’s an inside joke!!! Aaron had love for two special women in his lifetime, Cleo and Nina. He helped raise two daughters, Sheree and Sade. Aaron made his transition on Friday, March 22, 2019 at home in Champaign, Minnesota. Aaron leaves to cherish his loving memory; his mother, Geraldine Oates; two daughters, Sheree and Sade and their children; his sisters, Angela Avant (Frank), Anita Latham (Reuben), Anissa Green (Fred), Adrienne Brooks (Mizel), Arlene Oates (Shawn); four aunts and one uncle, James Reed, as well as, a host of cousins, nieces, nephews and many special friends from the neighborhood; too many to name; god-sister, Yeneba Smith; play sister, Bianca McBride.